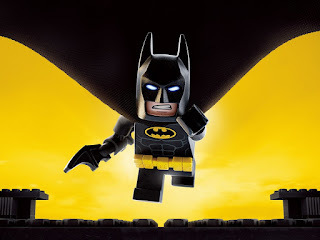 Rotten Tomatoes Plot: In the irreverent spirit of fun that made "The Lego Movie" a worldwide phenomenon, the self-described leading man of that ensemble - Lego Batman - stars in his own big-screen adventure: "The Lego Batman Movie." But there are big changes brewing in Gotham, and if he wants to save the city from The Joker's hostile takeover, Batman may have to drop the lone vigilante thing, try to work with others and maybe, just maybe, learn to lighten up. "All important movies start with a black screen (and end with a white" (one.) They also have fancy logos and "scary music." The Lego Batman Movie has all that... and a heck of a lot more. I haven't laughed this hard since last year's Deadpool, lofty praise for a cartoon (cough... animated feature.) Will Arnett is hilarious; and just wait until you find out who else is in it (Mariah Carey, Conan O'Brien.) The jokes are Family Guy-esque, with clever additions (merch gun, tuxedo dress-up party) and hilarious, obscure references (Gymkata!) Super funny with endless possibilities for sequels/new directions.